200 pages | 46 B/W Illus. In the post-genomic era we have, at our fingertips, an incredible array of genomic sequences from a multitude of complex organisms. There remains, however, the critical need to understand the precise roles individual genes play in complex biological milieu. Synthetic nucleic acids are at the cutting-edge of molecular strategies that target genes of interest in a specific, efficient and cost-effective manner. These tools are now being used as new and exciting gene-silencing agents in vitro, in a panoply of animal models, and as novel therapeutics in human disease. 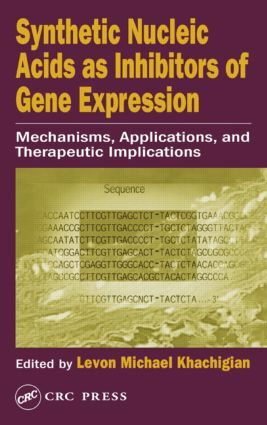 Synthetic Nucleic Acids as Inhibitors of Gene Expression: Mechanisms, Applications, and Therapeutic Implications brings together timely, authoritative reviews by renowned international leaders in the fields of ribozymes, RNA interference, DNAzymes and oligonucleotide decoys, with emphasis on biochemistry and translational research. The chapters on ribozymes include discussions of ribozyme subtypes, structure-function aspects, and therapeutic applications. This is followed by a comprehensive discussion of DNAzymes, their various subtypes, kinetics and biochemistry, and applications in target validation. Finally, the mechanisms and multiple therapeutic applications of double-stranded oligonucleotide decoys are described. For readers ranging from graduate students to researchers seeking target validation for pharmaceuticals to clinicians seeking innovative cancer and cardiovascular therapies, no resource is more complete and up to date than Synthetic Nucleic Acids as Inhibitors of Gene Expression: Mechanisms, Applications and Therapeutic Implications.